For this Smithsonian Institution project, researchers use motion-triggered camera traps to capture the animals' images. The small, ruggedized camouflaged cameras are waterproof, have multiple sensors, and can be locked. They are attached to trees or other natural objects. The camera's infrared recognition sensor detects animals at night and trips the camera, which takes rapid-fire pictures. Search the index of animals for the golden snub-nosed monkey, for example. 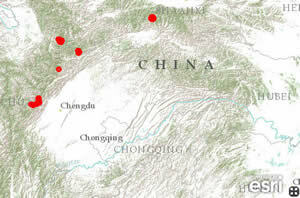 A map on the web page shows the primate's habitat in central China. If you zoom in on the map, you will also see images of other animals in the area such as the barking deer, leopard cat, and giant panda (more about the pandas later). "GIS takes the viewer from a bird's-eye view of the region and drills down to the camera location on the ground where these animals are recorded in space and time," said Robert Costello, national outreach program manager for the Smithsonian. "Each image is like a museum specimen in a sense. 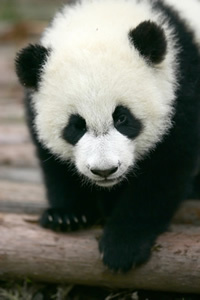 The photo is a voucher for the existence of that species at that place and time. It is a record with the potential of becoming more important over decades." When the site launched in 2011, popular media sources such as Wired magazine, Gizmodo, Engadget, and NBC Nightly News, quickly picked up the story. Smithsonian WILD has had as many as 57,000 visits in a single day. It is a cloud-based website with tools that access Esri's map services (basemaps) from ArcGIS Online. The project's images are managed on Flickr. After paying nominal fees for a Flickr Pro account and use of the Amazon cloud, Blue Raster quickly moved the Smithsonian's 206,000 images to the Flickr platform.